If you have read our previous white paper entitled “12 Reasons to NOT Appoint an Individual as your Trustee”, you already know why your clients should use a professional trustee or co-trustee rather than an individual for such an important role in their financial life. Having established that a professional/corporate trustee should be utilized, it is important to use care in the selection of that trustee. Helping your clients choose a corporate trustee can be approached methodically with a few due diligence tools. The goal is to create a list of 3-4 candidates which can be interviewed with a short list of questions focused on your client’s goals. What you do NOT want to do is to tell your client to simply pick the bank where they have their checking account or other banking relationships. the number of competing professional trustees located in the jurisdiction. The client should discuss the ideal location for the administration of their trust with their lawyer and ask for a recommendation before the search for a trustee begins. Most attorneys will recommend Delaware, South Dakota, Nevada or Alaska as the best states in consideration of the above factors. I know where I am, how do I get where I want to go? When a state for trust administration has been chosen, a trustee must be found that meets your client’s trust administration needs in that state. A list of trust companies in most states can be obtained by reviewing the website for the bank regulator in that state. 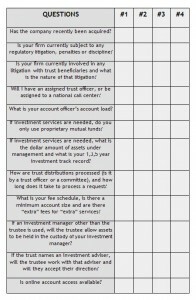 To identify a trust’s unique needs, answer the following questions and look for companies which can provide the services which these questions highlight. Will the trustee manage the trust’s assets, or will the trustee be asked to work with an asset manager who is currently managing other non-trust assets for the client? Will the trustee need to manage special assets such as life insurance, commercial real estate or mineral interests or will the trustee need to work with experts in those areas that are already a part of the client’s financial team? Will the trust own family partnerships or operating companies and will the trustee manage those assets or simply hold them in the trust and administer their cash flows? Will the corporate trustee make discretionary trust distributions or will distributions be directed by co-trustees or distribution advisers? Will an individual be appointed to serve as a co-trustee and will the corporate trustee need to partner with them? Will the trustee need to understand how “special needs trusts” are administered for beneficiaries who need to remain eligible for government benefit programs while receiving trust distributions? You will find that many trust companies cannot provide many of the services identified by these questions because they have determined that those services are outside of the business model which they are using to manage their trust business and ensure their profitability. For example, many trust companies will not partner with an outside investment adviser to manage trust assets or they will require trusts to use an investment adviser from their list, rather than your client’s preferred adviser. Many trust companies will not serve as trustee for trusts which own family businesses or family partnerships as their primary asset. Some companies will not serve as a co-trustee with individuals or accept any type of direction from any other party regarding duties which they believe must be handled by the trustee, regardless of the terms of the trust instrument. Whether a company can provide the services which your client needs should be revealed from a review of their web site or a phone call. A universal due diligence checklist. It is time to choose. Using the questions above should create a very short list of trustee candidates. They may all be able to serve the needs of your client competently, therefore the final choice may need to be based on instinct. However the interviews with trustee candidates should offer useful hints about the culture of the company. Their attitude and openness during the due diligence process will provide a good idea of what to expect during the administration of the trust. Will the company only answer questions if they have a lawyer or senior manager on the call? Will they answer questions on the phone, or do they insist on receiving questions in writing? Do they claim to be able to do anything, at any time, in response to any request, or are they realistic in their assessment of their limits and capabilities? Do they make an aggressive sales pitch during the interview or do they also ask good questions to decide whether your client’s trust would be a good fit with their company’s services? You have now equipped your client with the tools to make a good decision. Their children, grandchildren and perhaps generations beyond will thank you for the hard work that you have done to secure a better financial future for them.